Who doesn’t like French Silk Pie? 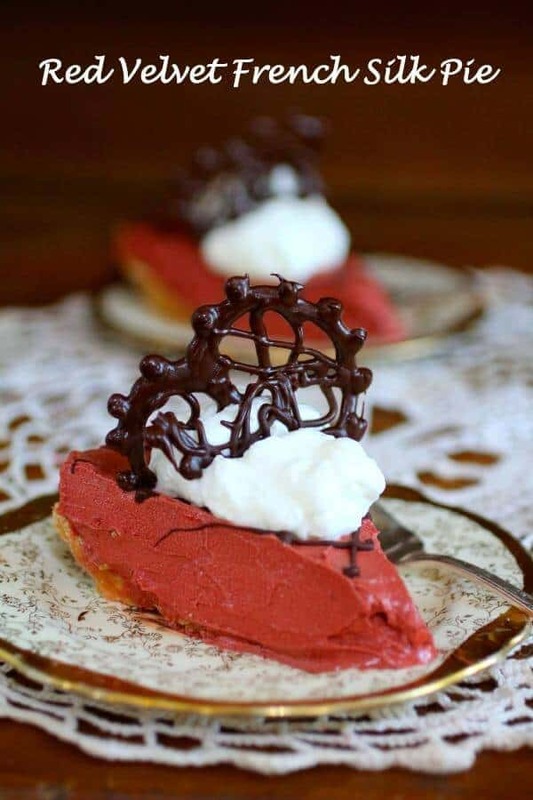 This Red Velvet French Silk Pie is smooth, rich, and creamy but with a beautiful color and unique Red Velvet flavor that you can’t turn down. Definitely an attention getter at any party or potluck! I don’t know about y’all but we love Red Velvet around here. In fact, you can go through the recipe index here on the blog and you’ll see a lot of recipes that are some form of Red Velvet from cheesecake to cookies… and even a real cake or two. It’s popular for a variety of reasons, Steel Magnolias not withstanding. First of all, the flavor. It’s chocolate but it has some other flavor in there that nobody can really describe. It’s just “red velvet” flavor and that’s enough to make it desirable, right? Second, it’s a gorgeous crimson color — at least when it’s done right. Red Velvet Cake is not meant to be healthy, it’s just meant to be good so don’t try to “healthy it up” with beets or some sort of natural coloring. It will be brown and there is nothing worse than a brown Red Velvet cake. Red Velvet has a following, a fan base, and maybe in the most generous sense of the term, groupies. All you have to do is mention Red Velvet and people come running. Side note, if I ever write a book about superheroes one of them is going to be named Red Velvet… and I guess with a name like that she’ll have to be a villain, albeit a lovable “good-girl gone bad” kind of one. Anyway. Perhaps it’s time to step away from the wine and get back to my blog post? This pie has the melt-in-your mouth texture of a really good French silk but the flavor is definitely Red Velvet. It’s not just a French Silk pie with red food coloring in it, I promise! It’s perfect anytime but especially so on the red holidays like Christmas or Valentine’s Day. I use raw eggs in this. If using raw eggs concerns you feel free to use pasteurized eggs but please don’t try to use some fake egg product or, God forbid, try to heat this up. You’ll have Red Velvet ooze. I make it in a 10-inch pie plate and get 10 slices from it. You may even be able to get 12 because this stuff is super rich. The following is an affiliate link. If you click through and buy then I get a small commission that’s used to keep the blog up and running. It doesn’t affect your cost at all. Thanks for being a part of Restless Chipotle! 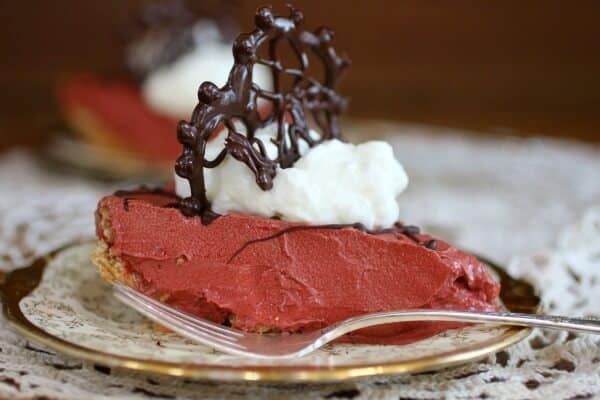 Silky and decadent with a gorgeous red color and that classic red velvet flavor, this French silk pie is the perfect end to any dinner. 4 eggs, , room temp. Beat butter and sugar on high speed until no graininess remains, about 10 minutes. Add the vanilla and the red food coloring; beat well. Spoon into crust and smooth top. Cover with a piece of waxed paper sprayed with cooking spray. Use plastic wrap to cover the pie and the waxed paper. Chill for 3 hours or more. I suggest caution in consuming eggs due to a slight risk of salmonella or other food-borne illness. To reduce this risk, I recommend you use only fresh, properly refrigerated, clean grade A or AA eggs (preferably pasture raised) with intact shells, and avoid contact between the yolks or whites and the shell. For recipes that call for eggs that are raw or undercooked when the dish is served, you can use eggs that have been treated to destroy salmonella, by pasteurization or another approved method. My kids are total red velvet nuts. They would love this and it’s a win win because French silk pie is my favorite! It’s so creamy, I know what you mean! Not much worse than brown red velvet anything. The pie looks delicious! I never thought of this and I love it! Genius and the color is so pretty! More red velvet for the Red Velvet Queen herself. Oh this looks so delicious Marye. I love French Silk Pie and here’s another winner for my holiday dessert table, so festive. This is amazing, I also love red velvet but have only ever had it in cupcake form before. My kids would especially love your pie!